SHOCK REPORT: Obama’s EPIC Fail…The American Dream Is CRUSHED! Another one of Obama’s promises for a glowing economic recovery bites the dust! Even though President Obama has always been able to talk a good game, he never seems quite able to get the ball across the goal at the crucial time. The dream of owning a home, for many of those who put their trust in Obama to make owning more affordable, is quickly becoming a fantasy that is out of their reach. The Obama administration has a tendency to conflate the strong performance of Fed-induced “assets bubbles” with “strong economic growth.” Unfortunately, as is often the case these days, the “hard data” paints a slightly different picture than the “narrative” being pushed by Obama and his staff. 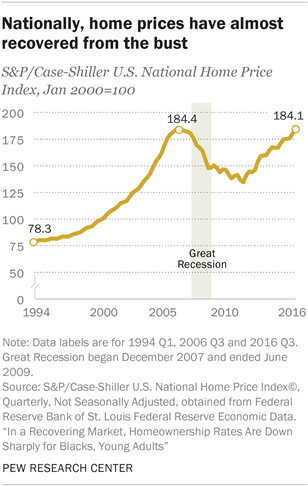 Per a new report from the Pew Research Center, and as our readers are undoubtedly aware, home prices have indeed recovered to pre-recession levels with a little help from Janet Yellen and crew. That said, the Obama narrative breaks down from there as further research readily reveals that home prices have recovered despite a massive drop in overall homeownership rates. Add all this to the fact that family incomes have declined during the Obama years and you have fewer families being able to afford the now higher priced homes. So much for Obama’s hope and change!